It’s never too early to teach your children how to save and spend responsibly. One of the best ways to promote good financial habits at a young age is to open a Kids Club Savings account at Local Union 392 Federal Credit Union! 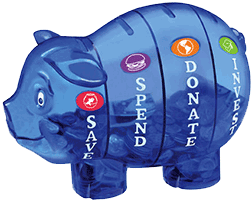 Savings Pigs are available in multiple colors while supplies last! * Certain restrictions apply. This bonus is available beginning 6/1/15 until further notice. Each child is eligible for this bonus once per quarter with each quarterly report card.